Let’s take an example that might be a bit artificial, but should not be too complex to demonstrate the techniques to eliminate the pitfalls of conditionals. The function toContactInfoList from the opening example parses the contents of a CSV file into a sequence of ContactInfo. The Boolean parameters control whether rows containing either an empty name or an empty email should be omitted from the result or not. Boolean parameters can be seen as a serialization protocol. The serialization on the call side and the deserialization on the implementation side are spots where things can potentially go wrong. Therefore the first step to improve the design is to get rid of these Boolean parameters by replacing them with a lambda. This way the caller no longer has to encode their intentions as Boolean values. Instead the caller can now pass a function, the actual intention, to the API. It can be good to give the caller a greater amount of control like this. On the other hand, this is not very convenient most of the time, and also error prone. So, we are only half way there. For a better usability the API should expose ready made implementations (in the form of functions) that the caller can choose to pass back into the API method. In our example these functions have the type Converter. Passing this converter (like so: toContactInfoList(csv, makeContactInfo)) is equivalent to calling the original version like this: toContactInfoList(csv, false, false). Now, to enable the caller to specify the other options, we will implement combinators. These combinators are higher-order functions that take a Converter as input and return a new Converter, therefore have the type: Converter => Converter. The returned converter combines the behavior of the converter that was given as an input parameter with a new behavior. Not only is it much easier than before to reason about what’s going on, we also eliminated the potentials for errors related to encoding and decoding of intent. Also the caller can now provide custom converters. 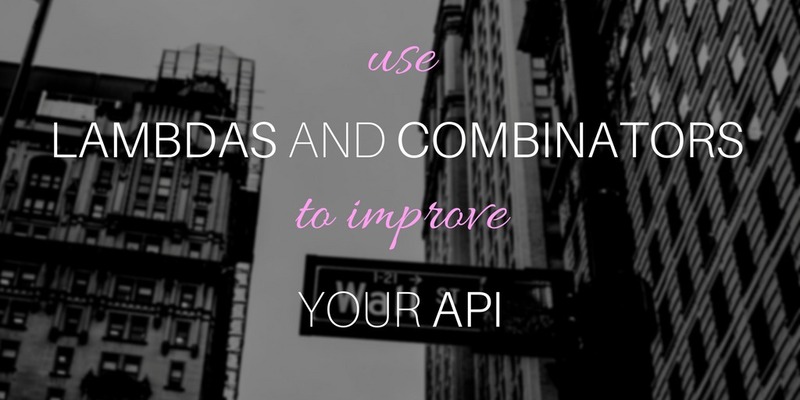 Moreover, with the new design it is possible to extend the API by adding more combinators in the sense of the Open-Closed Principle. Note that in Scala we don’t have the same guaranties for purity and control of side effects as in PureScript or Haskell. However, I definitely think the benefits described in this post make it worthwhile giving these techniques a try. What do you think? Let me know in the comments!